Surprise! Chief Kang is rushed to the hospital and lives! Or at least for now, in the ICU. Dae-gu tells Pan-seok what he witnessed with Soo-sun, and they decide to reveal everything so they could catch the real culprit. Dae-gu and Soo-sun rush to Chief Kang’s house (didn’t know she had a house, since she was perpetually in the office), but someone has clearly rummaged through her belongings already. While searching Soo-sun finds some letters Dae-gu wrote to Chief Kang when he was younger, as well as some little trinkets. Among the trinkets is a small picture of Dae-gu and Chief Kang together, which Soo-sun tells Dae-gu to put near Chief Kang’s bed to help her wake up. At the station, Toad is throwing a fit because makjang drama keeps on happening. Pan-seok tells Toad about Assemblyman Yoo and the whole backstory, to which Toad suddenly decides he will assist in this particular case. The team gets to work on the case, with Toad and Eun-dong investigating the crash, Tae-il trying to recover the security image in Hyung-chul’s car, and looking for the recorder with Pan-seok. 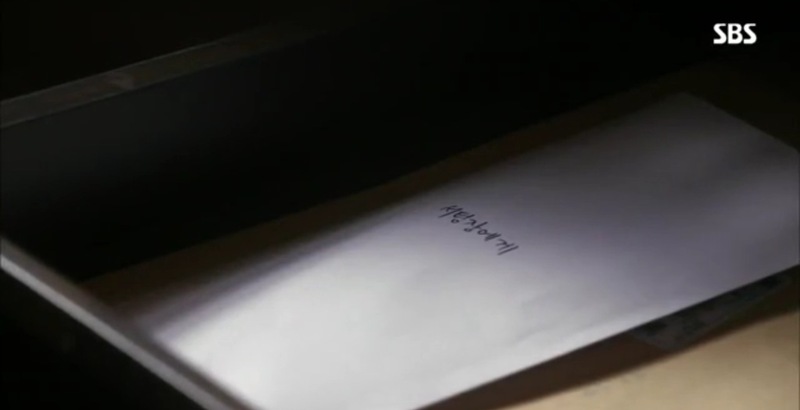 While looking through her drawers, Pan-seok comes upon a letter Chief Kang wrote beforehand, entrusting Ji-yong/Dae-gu to him after she confesses everything at the special committee meeting. So where is Dae-gu at this time? He is sitting by Chief Kang’s hospital bed reminiscing about the past. He talks about how he pinned a carnation on Chief Kang for parents’ day in recognition of her as a parent to him. That day they went to a photo booth and took a picture, which is the one Soo-sun found at Chief Kang’s house. Dae-gu flashes the picture in front of the unconscious Chief Kang and demands that she wakes up. After he leaves, a tear rolls down Chief Kang’s face. Is she conscious? Or coming to being? Toad comes into the team room and hands over a security footage of the truck being idle by the road for over three hours. He states that the truck was on the road for about five minutes before hitting Chief Kang’s car, so there is no way the truck driver was asleep at wheel per claims. Just as everyone is praising Toad for his hard work, Pan-seok receives a dreaded phone call informing him that Chief Kang has alas past away. why must it always precipitate? 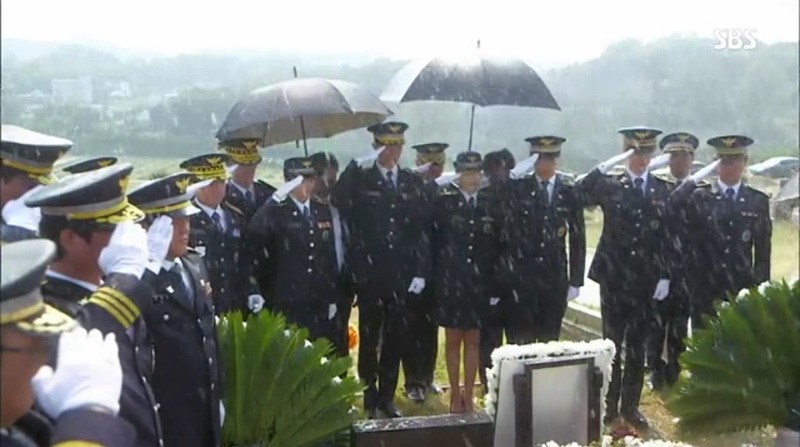 While it pours, Dae-gu and the team bury Chief Kang’s urn in the cemetery. And who shows up but Assemblyman Yoo. The nerve of this man. After the funeral, Pan-seok shares with Sa-kyung how much he wanted to be like Chief Kang because she once said they must continue to investigate a case until the victim’s family is satisfied. He expresses his regret over not trusting Chief Kang until the end, and how his passion has died. Sa-kyung comforts him and says that Chief Kang is the real police woman. I cant relate to the sentiment, but I’m not sure that is a correct assessment. In the morning, Gook prepares a bunch of food and the three boys eat a big breakfast. While eating Dae-gu receives a text from Soo-sun asking to see him at the playground in front of his apartment. Gook asks what is it and Dae-gu covers it up by saying it was spam. Koreans sure get a lot of spam huh? At the playground Soo-sun gives Dae-gu a box of rice balls that she has made. She eagerly anticipates his compliments and he says the rice balls are not ok, but are delicious. Dae-gu suddenly demands Soo-sun to never betray him, and if she does to declare it ahead of time by saying “I’m going to like someone else now”. She agrees and he proceeds to ask for another request which is for her to never die in front of him. She promises but also asks for him to tell her when he is sad or mad or want to cry instead of stuffing his face with rice balls. At the station the team views the footage Hyung-chul caught on his car camera, which shows Kim Ha-shin, Assemblyman Yoo’s lawyer, giving Hyung-chul a briefcase of money. The team suspects that this was a payment for Dae-gu’s murder. Just then Toad enters the room and announces that the truck driver has finally caved under his “excellent” interrogation skills, and that the culprit is Kim Ha-shin. The team brings Kim Ha-shin in for investigation, but he just pushes all the crime onto Ae-yeon who is now in the mental health center for schizophrenia and depression. kim ha-shin is much more of a pro in answering questions than ae-yeon, unfortunately. Just then Ki-jae comes in to the station with the DNA report which shows that he is not related to Dae-gu. 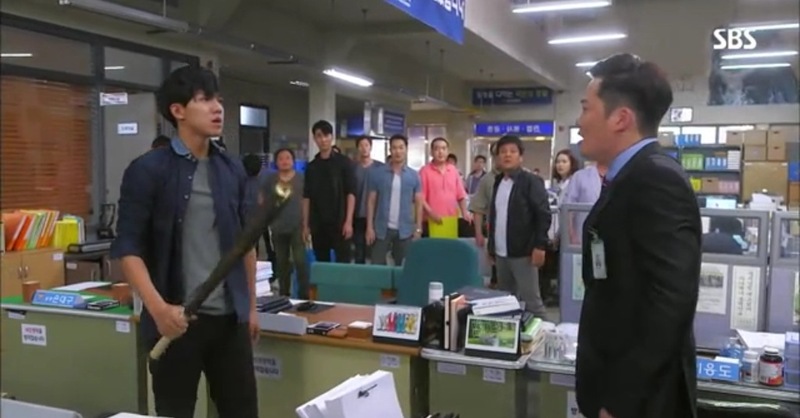 The team is confused why Ae-yeon murdered Hwa-young and decide they need to locate Ae-yeon first. So Sa-kyung and Tae-il go out to look for Ae-yeon while Dae-gu confronts Ji-il. Ji-il is surprised by the DNA results as well and goes to Assemblyman Yoo to ask for Ae-yeon’s location. Assemblyman Yoo taunts him and insults him for using the Yoo family’s wealth for selfish gain. Meanwhile Soo-sun and Gook are at Chief Kang’s house looking for the recorder again. She goes through a box of old cards from Dae-gu and it suddenly dawns onto her that the recorder could be in the box. She flips it over and cuts through the box to find the recorder! Back at the station the team listens to the recording together to find out that Assemblyman Yoo had arranged for Hyung-chul to forge a paternity test 11 years ago. The paternity test was supposed to state that Dae-gu is Ji-il’s illegitimate child with Hwa-young. Assemblyman Yoo had intended for this to anger his daughter and drive her away from her husband so she would spend her money to fund his campaign instead. Remember the prosectuor from where back when? The one Pan-seok beat up at one point? Well, he and his entourage show up and start to take away the team’s stuff. Pan-seok inquires what they are doing and the prosecutor declares there’s a change in the investigation. Dae-gu comes out of the room with a bat and starts to smash up everything in sight. The prosecutor is completely stunned and they leave for the time being. im mad! im so mad! i don’t know who my daddy is!!! Dae-gu announces that he is quitting, but Pan-seok is able to convince him to stay until they reveal the truth. The team starts calling up different media and exposing the Masan nurse murder case and all that is involved. They gather around the TV to watch a press conference but the same prosecutor appears and pushes everything onto Ae-yeon. 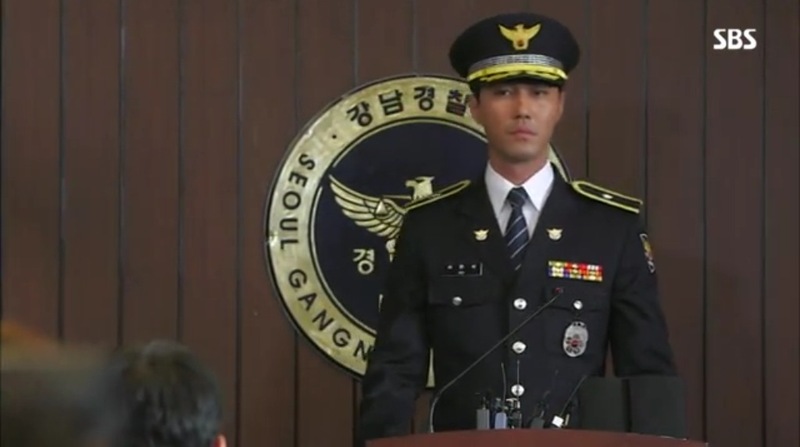 A few days later the police station hosts a media press release and Pan-seok goes up on stage. He removes his hat, uniform, badges and handcuffs. He displays these items on the table and declares his decision to resign because he wants someone else to resign. Tomorrow is the last episode! Come back for our final recap! BTW, what should I recap next? Any thoughts?